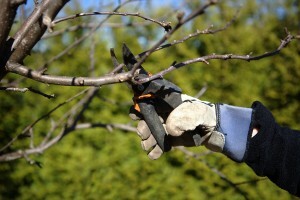 Pruning your plants will help promote new growth during the most important growing season. Right when we thought spring was here to stay, winter storm Stella comes and reminds us that the weather in the Maryland never follows any rules. When you’re done shoveling and are inside warming up with a nice hot drink, take a second to dream of spring and keep these lawn care tips in mind. Underneath all that snow is a heap of dead leaves, branches and who knows what else. The first thing to do is clear all of that lawn debris so you have a nice clean start. All of that semi-decomposed debris will block plants and grass from getting the oxygen and sunlight they need to kick-start growth. Don’t just throw out all that debris, though. If you’re already an avid composter or just looking to get started, the leaves and sticks that have been sitting and decomposing all winter are perfect for composting. Weeds are notorious for growing anywhere and everywhere, so getting a jump start on keeping them out of your flowerbeds is an important first step. As soon as soil thaws, get to work cultivating in areas you commonly see weeds. This will make it harder for weeds to take root. Any weed you see pop up grab it. Weeds will only get stronger as the growing season continues. Now is an important time of year for perennials. Since they live for multiple years, perennials need a strong growing season to ensure they last as long as they should. Pruning is a good thing to do this time of year. Plants and grasses need to be cut back before new growth appears to promote that growth. A lot of lawn maintenance and care depends on the tools we use being in working condition. As the saying goes, “Tools don’t make the job easier, they make the job possible.” Check your shed and make sure everything that needs to be repaired or replaced is before you head out to tend to your lawn and realize the tool you need is broken or missing. For over 12 years, Jason Kahler and his team at JFK Lawn & Landscaping have been providing outstanding landscaping services to homeowners and businesses throughout Howard County, and recently expanded to Montgomery County and Carroll County. Family owned and operated since 2004, JFK offers services including lawn maintenance, turf enhancement, general landscaping, gutter cleaning, and power washing, as well as snow removal services in the winter months. To learn more about what we do, check out our About Us page or our FAQ section. This entry was posted on Thursday, March 16th, 2017 at 9:44 am. Both comments and pings are currently closed.